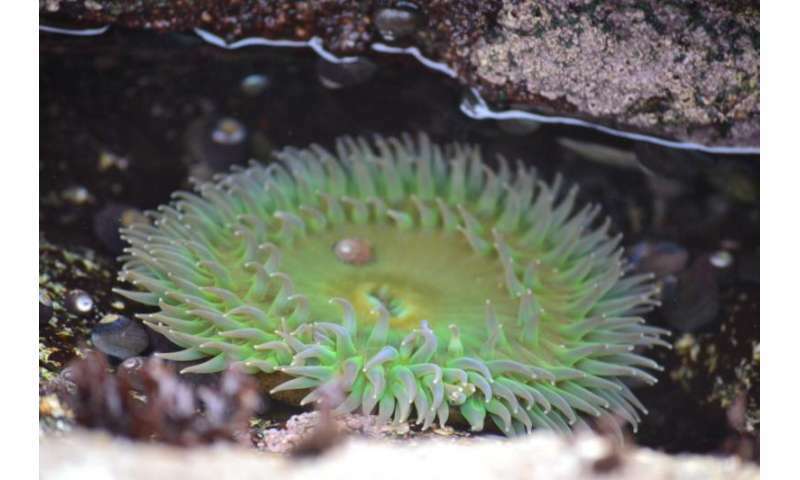 A new study, based on the most-extensive set of measurements ever made in tide pools, suggests that ocean acidification will increasingly put many marine organisms at risk by exacerbating normal changes in ocean chemistry that occur overnight. 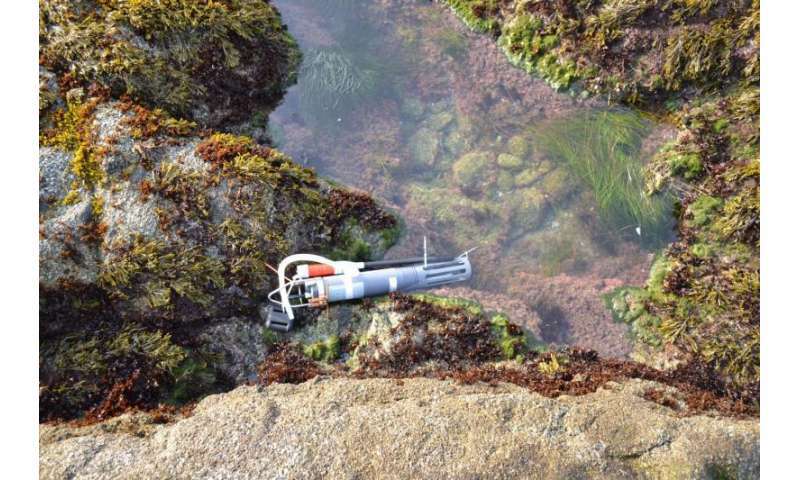 Conducted along California's rocky coastline, the study from Carnegie's Ken Caldeira and Lester Kwiatkowski shows that the most-vulnerable organisms are likely to be those with calcium carbonate shells or skeletons. It is published by Scientific Reports. When carbon dioxide emissions from cars or power plants are absorbed by the oceans, it changes seawater chemistry and makes it more acidic, a process called "ocean acidification." Increasing ocean acidity makes it difficult for organisms that construct their shells and exoskeletons out of calcium carbonate, such as mussels and oysters, to continue to build these protective layers. In high enough concentrations, carbon dioxide can even cause these shells and skeletons to dissolve entirely. Tide pools along California's rocky coast are isolated from the open ocean during low tides. During the daytime, photosynthesis—the mechanism by which plants convert the Sun's energy and atmospheric carbon dioxide into sugar, giving off oxygen in the process—takes up carbon dioxide from the seawater and acts to reverse ocean acidification's effects. However, at night, plants and animals respire just like we do, taking up oxygen and releasing carbon dioxide. This adds carbon dioxide to the seawater and exacerbates effects of ocean acidification, causing the increasing risk to calcifying organisms. 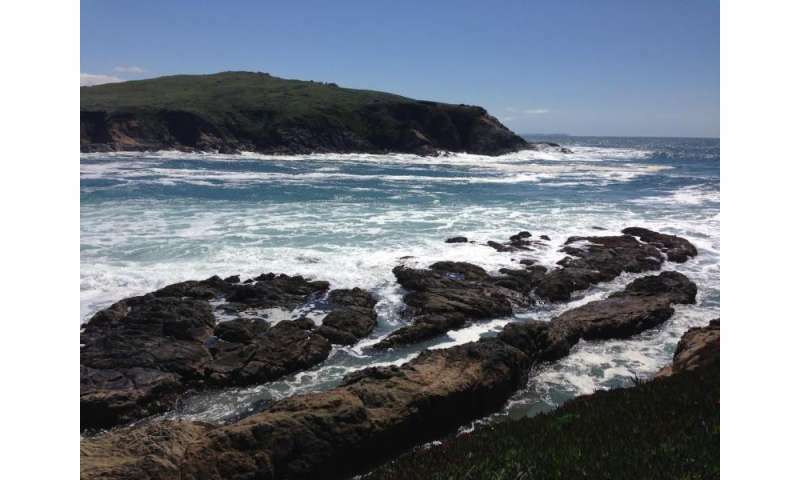 Observing a variety of California's natural rocky tide pools on the UC Bodega Marine Laboratory, the authors found that the rate of shell and skeletal growth was not greatly affected by seawater chemistry in the daytime. However, during low tide at night, water in the tide pools became corrosive to calcium carbonate shells and skeletons. The study found evidence that the rate at which these shells and skeletons dissolved during these nighttime periods was greatly affected by seawater chemistry. "Unless carbon dioxide emissions are rapidly curtailed, we expect ocean acidification to continue to lower the pH of seawater," said Kwiatkowski, the study's lead author. "This work highlights that even in today's temperate coastal oceans, calcifying species, such as mussels and coralline algae, can dissolve during the night due to the more-acidic conditions caused by community respiration." Caldeira added: "If what we see happening along California's coast today is indicative of what will continue in the coming decades, by the year 2050 there will likely be twice as much nighttime dissolution as there is today. Nobody really knows how our coastal ecosystems will respond to these corrosive waters, but it certainly won't be well." What is ocean acidification, and why does it matter? Saw a video the other day of divers researching ocean acidification. It looked like they were swimming in a kettle of boiling water. The acid working on the carbonate was releasing gas all over the bottom. They said this was becoming common. If we even had the common sense of a coal miner this would be a dead canary and alarm bells should be going off everywhere, there should be panic in the streets. If we weren't stupid that is, unfortunately we are beyond stupid as a society. I live in Ohio and I didn't realize how acidic our rain is until I started to use rain water exclusively to fill our pool. I have to treat the water to prevent the deterioration of the liner, equipment. I don't think people realize how harsh the acid is to our environment. And people in California wonder why we can't get abalone any more.